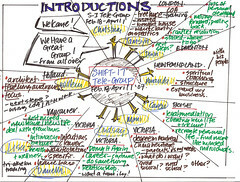 A new series of the SHIFT-IT Tele-group has just begun. 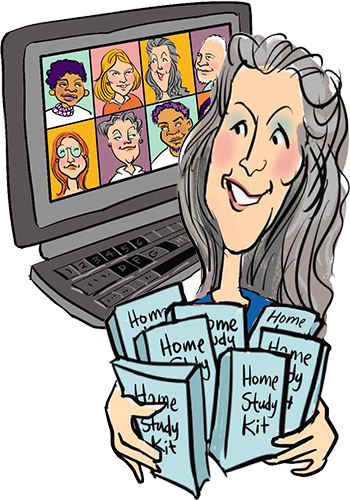 This seven call tele-coaching group runs February 18 – April 1. We had our first call on Sunday morning. A great kick-off with participants from all over the globe: Canada, U.S., England, Netherlands and New Zealand. 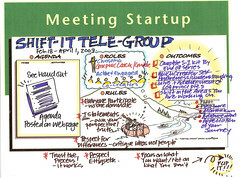 Using conference calls and a special webpage for downloads and images … we are off to a great start. We are using the new SHIFT-IT Home Retreat Kit as our foundation. 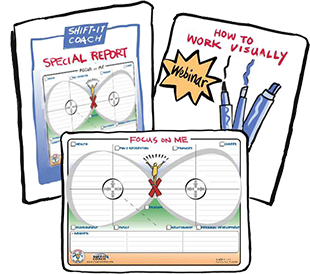 Working our way step-by-step through the SHIFT-IT Graphic Coaching Process. Folks in our group are focusing on several subject or shift areas: career transitions (job changes, segues to self employment and entrepreneurship), health & fitness, relationships and money to just name a few. And, we have several people who are very into Law of Attraction principles and want a good place to learn and further refine their deliberate creation skills. Below is our Start-Up Chart, outlining our ourcomes, agenda, roles and rules. And a quick Introductions Chart. To view images in larger format: go to my Flickr Photo Viewing Page. If you’d like to join us, you can, up until the 24th of February (sign ups are ok until just before the second call … after that you’ll have to wait until the next offering of this format … not until Fall ’07). For more info and registration form: click here. Great for people in or contemplating a transition. Unique graphic coaching and Law of Attraction techniques. Designed to help you Become Your Next Self. Whatever the ‘IT’ you are wanting to SHIFT. You will develop a very clear, refined vision of what you really, really want for yourself. Will do lots of belief and allow work (bust through the internal blocks that are keeping you from having it … lots of Law of Attraction work ) and will identify and move on aligned action steps that are enjoyable, feel good and move you towards your desired vision. Its good stuff. Come join us!